BEGINNING IN DECEMBER, all Ontario field crop, vegetable, fruit and specialty crop farmers are asked to fill out a confidential survey of pesticide use for the Ontario Ministry of Agriculture and Food and Ministry of Rural Affairs (OMAF and MRA). 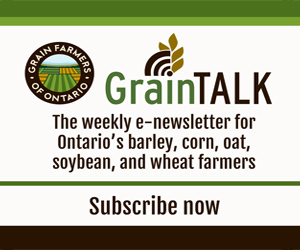 This year, the survey is being conducted by Farm & Food Care Ontario. OMAF and MRA, commodity boards, and researchers use the information to help improve minor use pesticide registration lists, work toward safer use of pesticides and to understand trends in the types of pesticides used. The survey will track all field and horticulture crops and the pesticides used, acres applied and also acres where no pesticides are used. Farmers are proud of how they use crop protection technologies, and this survey helps the industry understand the factors used by farmers to select the types of products used. Surveys have been conducted every five years since 1973 and the data has allowed both regulators and policy makers to track trends in pesticide use and make informed decisions. Previous surveys have shown positive trends toward safer products as well as an overall decrease in the use of pesticides by an impressive 45 percent in the last 25 years. With increasing interest in seed treatments used in agriculture, this topic will also be added to the 2013 pesticide use survey, including the number of acreage planted with treated seed and the active ingredients in the seed treatments. The survey is anonymous and only a respondent’s county information will be collected to help determine pesticide usage in different parts of the province. This year’s survey will be easier than ever as data collection has moved to an online program with drop down menus for ease of use and accuracy of the data. Farmers do not need to complete the entire on-line process at once, but can save their work and return to it at a later time. Farm & Food Care will also accept mail-in, fax or email returns of the survey. All farmers and custom spray applicators are encouraged to fill out the survey of products they used during the 2013 growing season. The survey will be available online at ontariopesticidesurvey.ca beginning December 5, 2013. Data collection will continue until February 15, 2014.